Most common 'simple' question type. Allow only 1 answer (single response) or multiple choice, where checkboxes are available. In this example, we have a multiple choice question, with 7 brand names to choose from. And an 8th special one, that resets the others, because you can't select both a smartphone brand and "Don't have one". We use the column 'Exclusive' and ticked that box, so the last options becomes a radio button. We choose a custom color scale, to overwrite the default green color. And sorted questions as defined. Other display options are: sorting on highest voting frequency or alphabetical order. Make short answer options, so users can choose easily. Also the display in the smartphone and text alignment in the reporting graph looks better. Don't ask negative or (double) denial questions. People tend to misread or misjudge such questions: Example: Which isn't a fruit that you don't like? In this example, we defined a multipe choice question, with an image on the left besided the question. A normal question for your audience. The Don't know option will reset other selected questions options when selected. There is no control or check validation option like 'choose minimum of 3 and max 10 options.'. Most of the times an instruction in the instructiontext is good enough for your audience. Each vote counts equal, and in this result, the reporting shows percentages of the total 100%, with the horizontal bar as %. You can also set to absolute numbers, and sort the most voted answers on top, or alphabetical. You can set it in the designer per question. To prevent bias when users still have to vote, when there are already answer results or votes visible to your audience, use the 'C' (toggle chart) on your keyboard. It will hide the chart results, until you are satisfied. If you run a quiz, we advice to use the autoclose timer and show the results only after the voting round is over. You can toggle the chart if you like with C in the keyboard. (see top left gear icon on live screen with other keyboard options). Also, in quiz mode, you can choose to color the correct answers green, and wrong answers red, or different colour. Or you can keep all answers in the same color, and show the quiz results only at the end for the correct answers, marked with a 'correct' answer (thumb up) besides the answer text in the designer. Question type that reports as a wordcloud or frequency. Use this question type for opinions, suggestions or 'single' words to capture from your audience. For full long sentences, use the Q&A - Question and Answer Module. Hint: You can use this question type also to ask for user credentials, like name, city, e-mail or phone number. Beware: the wordcloud shows them on screen (or in the Excel export). VoxVote voting is anonymous by default. And we don't want your audience credentials, nor email addresses. In case you want to identify your quiz winner names, use the nickname option in the voting devices on your smartphone screens. A normal question for your audience. The 8 given will count with a weight of 8. Most frequent words (profanity and course words, as well as stop words like the, is, me, we etc. are filtered out). are shown larger based on their frequency. For speed 'only' the top 300 words are used. On refresh (letter R, or the refresh control button), the WordCloud is redrawn. You can press R until you are satisfied. from which city is my audience today? For each possible answer set a weight. In this example, all numeric numbers between 1 and 10 have the same weight. In this example, we also included an 11th option: 'Don't know' with a weight of 0. And 0 weights are excluded in the calculation for your average. With always,sometimes,often,never kind of likert scales, you can set your 1 to 5 point weights or similar. Live chart screen. Weighted Average. All the users votes, combined, devided by the users with a weight > 0 sums up to this result. Here, 10+9*4+8*6+7*8+6*4+5*2+4+3 = 185 / 26 users = 7.12 average. Define your answer options, and the audience should rank them with 'most' importance. Double ranks are not allowed. In this example we defined 7 answer options, and each user can rank them with number 1 to 7. If your audience only ranks only a few items, the remaining can be left blank with rank 0. Hint: give an instruction in the instruction text for your audience. Rank 1 is your most important item. Rank 2nd, 3rd etc. Live chart screen. Scored rank per item. All the user ranks are calculated, based on highest rank 1, receives 7 points, when there are 7 answer options. See .pdf calculation example. Most users ranked 'Battery life' as highest rank, so often rank number 1 or 2 are given. Resulting in a 6.6 on a scale of 1-7. Audience nicknames / who already joined? There is nothing in the designer to setup, but you can ask your audience to fill in a nickname. (in Quiz, we recommend it). To have a much as unbiased votes, anonymous voting is the default. A nickname or your city name could be a simple way to tell your host / event organizer your successfully joined the voting session. You don't have to give your real name, a nickname is good enough. In case of a quiz, we advice to give a better name than John D.
Use the refresh button to show the updated list. When you think the majority of your audience is connected, start your vote. (letter S on keyboard, or use the controls on top). VoxVote contains all the features you expect from an world wide lading Audience Response System. Why struggle with expensive infrared voting devices, or charge your audience with costs when voting with text or SMS? No we don't do that. Spice up your "All Hands" or Townhall meetings and engage or interact with your audience. We vote over IP, vote through WiFi or any other http(s) connection. With your smarthpone or tablet. And 100% do it your self. No tech assistance needed, or any installs. It's all browser based. You can try it yourself now for free. Main features, shortly described. See our faq or our turorial section for detailed info. Vote anonymous. This improves audience responses. Maybe you want to know the names and results from your audience. But the audience only wants to vote. Secure voting with https, and eyeblink fast. Unlimited Audience. If your group has 50 users or 1000+ users, we don't care. Also in the free version. Single and Multiple response question types. Weighted Average. Calculate a weighted average bases on user votes and your weights per answer option. Questions and Answers module, messaging module for questions from audience and centralized moderating. 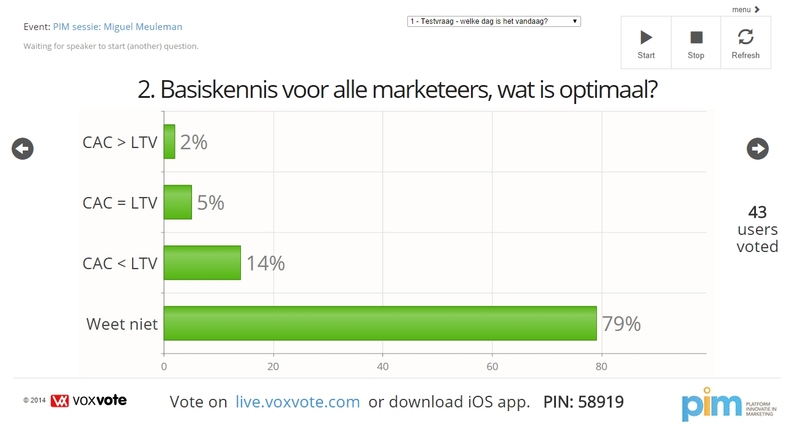 Live graph results. All votes are realtime plotted on the chart on your timing / requests. (so nobody is influenced when they have to vote). Keyboard controls to start/stop and navigate to control your questions and layout of the chart screen. PIN: Personal access code. A random 5 digit access code is generated for access for your audience. You keep it for live. Instant new questions. How flexible! Is there a question from the audience, or a new topic you want to add? Add instantly. Run a VoxQuiz™ - our Quiz option and see who scores best on your topic. Logo/Branding - add your company logo as a default logo, or use specific event logo's on the live voting pages. Smartphone voting: You can vote with any smartphone that has a browser. Historic overview from your archived and running events. Email summary to all participants (who left their emailaddress at the end of the event).